I received my secret ingredient on Aug 11, 2011, but never got around to posting about it. This is a long one, and has been long overdue too. PJ of http://seduceyourtastebuds.blogspot.com/ sent me the secret ingredient. I was not sure if I would recognize it, but yay! I did! It was a box-full of powerhouse of Omega 3. Yes you guessed it right, Flaxseeds! Thanks PJ for the sweets and the Nita Mehta book! And this is what happened after the box of sweets was opened! Read on about Arusuvai, and for all those food bloggers who don't know about it, you would die to be a part of this friendship chain! Mix all this together with hand. Check for salt and it should taste lemony. This is your filling. Fill in the stuffing in medium sized balls. At this stage you can roll them out and make stuffed parathas. 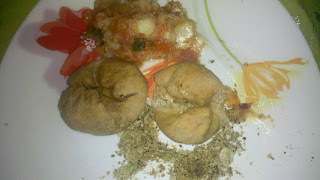 We let them be as balls, grease them with ghee / home-made butter and bake them in the oven. These are called littis and are a staple in Bihar and UP. I baked the littis at 180 deg for 45 mins. I served with aloo- tamatar ka bharta. Heat oil in a tadka pan. Add the chillies and let them cook. Add this to the seeds mix, grind them again. The oil in the seeds makes them blend well together.The chutney is more of a powder than paste. Add salt to taste and a tasty chutney is ready, can be served with rice / rotis. Everyone is aware of the Omega 3 in Flaxseed / teesi. Sesame seeds, especially the black ones, are rich in calcium, and should be consumed daily by expectant mothers and new moms. I have thought of this chutney because PJ who sent me the secret ingredient, is going to be a mom soon! She is going to have a second baby! She is having a tough time, and she needs all our wishes and prayers. I am awed by her enthusiasm to keep the event going, as she found time herself to send me the packet. Thanks PJ! PS- I am looking for fellow bloggers who want to be part of the Arusuvai (You need to be in India). Check the links above, and if you do want to be a part of this chain, leave me a comment. I am sending the Til ki Chutney recipe to B2B-Back to Basics- Spice powder at DSM's blog. sorry for such late reply Richa. the sattu filled buns look awesome . am updating the round up today itself. thanks for your participation dear.